It’s a big year for the Star Wars franchise; the definitive series will see its long-awaited sequel trilogy release in December and now, the countdown is on. 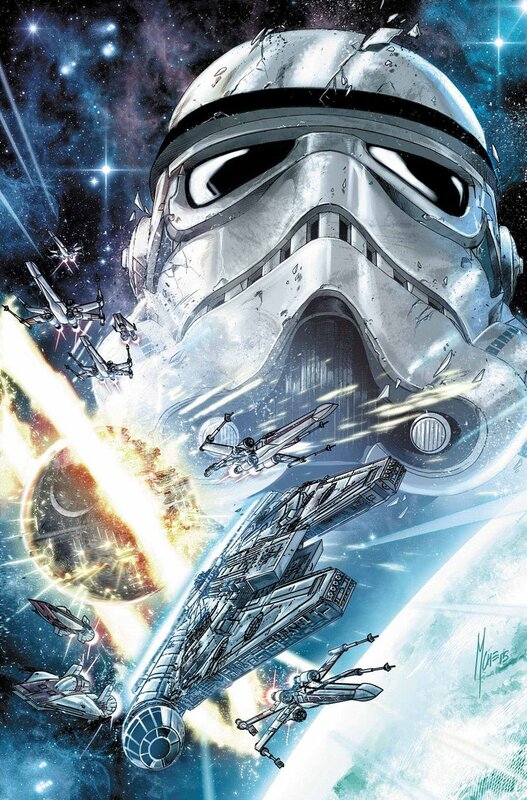 In partnership with Marvel, Lucasfilm is expanding their universe through comics and with this week’s release of Journey to The Force Awakens: Star Wars Shattered Empire, sci-fi fans can find out what happened in the wake of Return of the Jedi, leading into 2015’s most anticipated film. Written by Greg Rucka (Batman, Wolverine) and illustrated by Marco Checchetto (Avengers World, Punisher), Shattered Empire follows the success of Marvel’s other Star Wars titles in capturing the spirit of the original films. 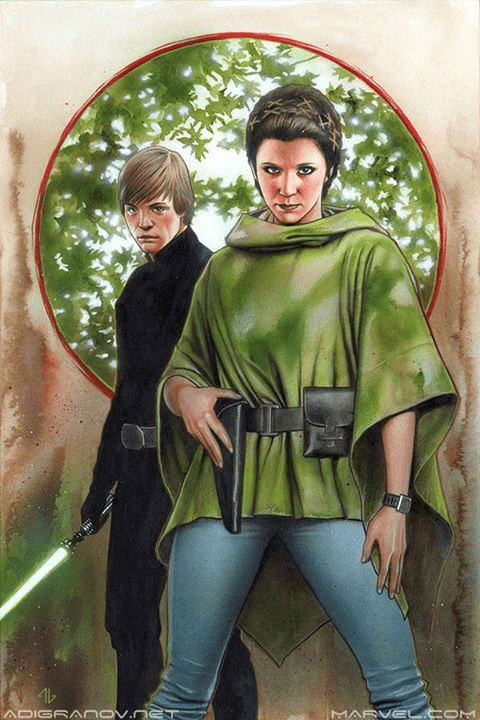 The opening of the comic throws the reader into the climax of Return of the Jedi and follows Shara Bey, a Rebellion pilot that flies under the call sign Green Four. Shara is a skilled pilot, and her aerial prowess is immediately apparent during the opening space battle. She is efficient and deadly in the cockpit of an A-wing. Rucka’s story follows Shara through the Battle of Endor and into the celebrations afterwards. She helps Luke escape the Death Star’s blast radius, crosses paths with Lando Calrissian and Han Solo, and reunites with her husband against the backdrop of Ewoks and fireworks. The entire issue is a setup for the final couple of pages where the series’ main conflict is introduced. Rucka’s story successfully emulates the kinetic energy of Jedi and draws the reader back into the thrilling final scene of the movie. The action is caught in realistic glimpses as it follows Shara’s A-wing through the chaos of battle. Rucka’s characterization is as strong as his action as he captures the heart of fan favorites like Solo and gives Shara a voice of her own. It is easy to believe in her conviction as she works tirelessly for her cause. The shortfall of this volume is its pacing. The opening is compelling and energetic, but as it moves into its third act and introduces a larger conflict, the issue begins to feel rushed. The story becomes inorganic and feels as though big sections of it ended up on the cutting room floor. Even though the end of this issue takes an unfortunate turn, the beginning is compelling enough to engage the reader. Hopefully the rest of the series will follow the tone of the introduction. Checchetto’s art is the perfect accompaniment to Rucka’s script. It perfectly captures the chaos of the battle and the joy of the celebration. Beyond that, he has captured the likenesses of the characters and made them his own, creating an energetic and realistic universe for the script to take place in. The early pages play with perspective, splashing larger-than-life heroes and A-wings against the exploding backdrop, creating a lot of visual interest. But like the story, the art loses momentum and the bold splash pages gradually transition into a systematic arrangement of panels. This lessens the thrill of the story and detracts from the action. 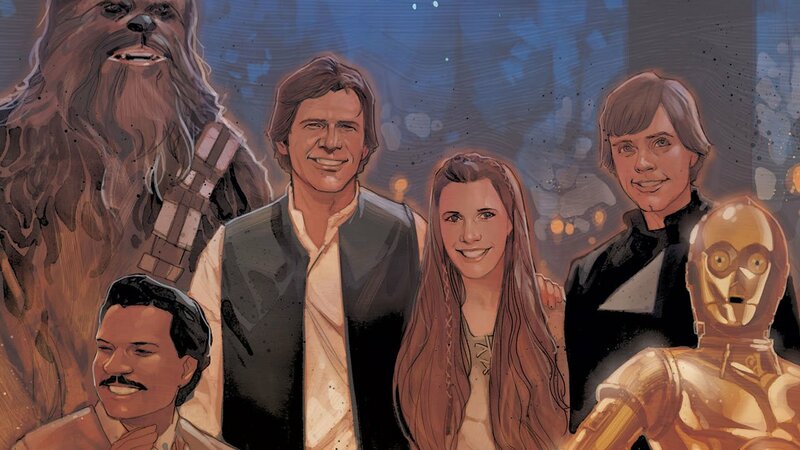 Shattered Empire is a fun contribution to the Star Wars franchise. The book, unfortunately, loses steam at the end, but the excitement of the opening battle and the groundwork for the rest of the title make it worth a read.